Although only just over an hour’s drive north of Hiroshima city, you can’t get much more off the beaten track than Ohnan [邑南]. Nestled among the Chugoku Mountains in Shimane, Japan’s least visited prefecture, it is an excellent place to escape the crowds and get a real taste of rural Japan. 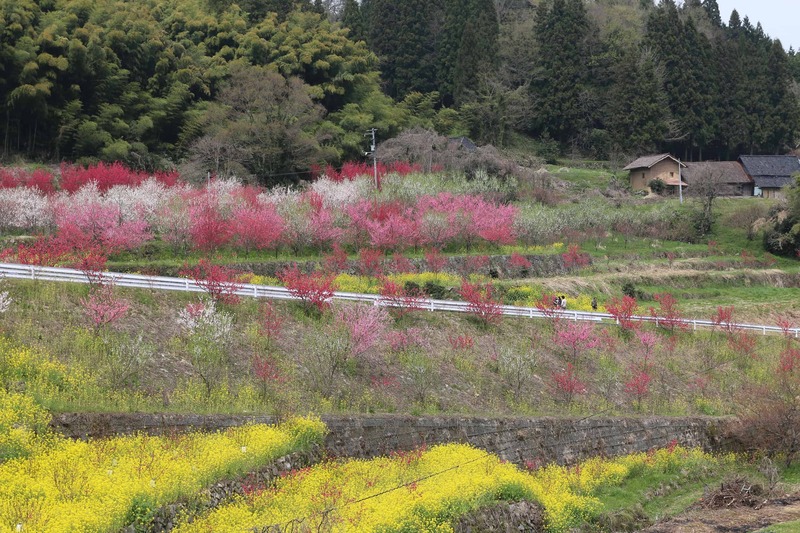 Although the group of farming communities linked by narrow valleys that make up Ohnan all have their own long histories, the administrative district itself was created in 2004 from a merger of Iwami, Mizuho and Hasumi. Dotted with medieval hilltop castle sites and ancient shrines an exploration of Ohnan, along its rivers, among its rice terraces and into its gorges, conjures images of the Japan of old. The town is also looking to the future. While much of rural Japan is threatened by a shrinking and aging population, Ohnan is bucking the national trend. “We make raising children easier!” proclaims the town’s mascot, ‘Ohnan Sho’, modeled on the giant Ōsanshōuo giant salamander that inhabits local rivers. It may not exactly trip off the tongue, but the waiving of school fees and other incentives are attracting young families and the under 18 population is on the rise. Further, by boosting its reputation for premium organic produce and gourmet cuisine, the town hopes to provide reasons for this new generation to stick around. Ohnan is also proving to be an attractive destination for “I-turn” entrepreneurs who are trading city life for the simple pleasures of the countryside. There is in Ohnan, a vitality and optimism, rare in many of Japan’s picturesque, but dwindling rural communities. 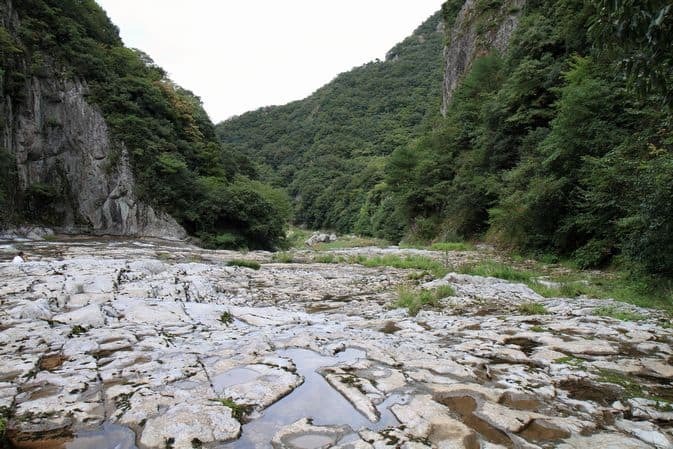 Many of Ohnan’s visitor facilities, such as Koboku-no-mori Herb Garden, eateries and onsen hot springs, are concentrated on the rim of the O-hochi Basin. It is from here that you may see the unkai sea of clouds early on spring and autumn mornings, if conditions are right. Spring is the time to catch the expansive and fragrant herb gardens in bloom. 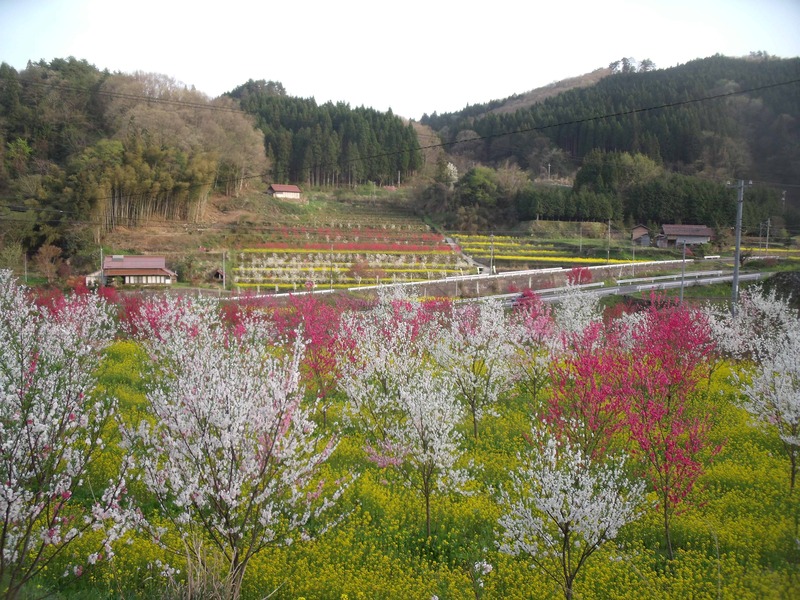 Koboku-no-mori is also a great example of Ohnan’s commitment to organic farming. Reasonably priced Japanese and Western food is available at the Kamuri restaurant overlooking the garden from mid-March. 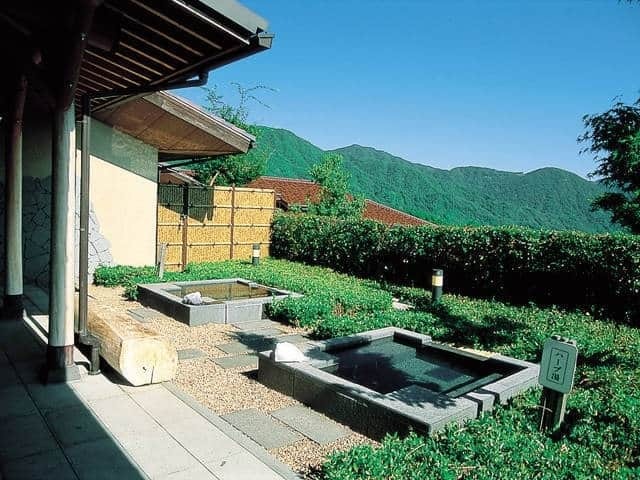 Very pleasant public onsen hot spring with indoor and outdoor baths, including baths infused with herbs from the garden just below. There is also an informal canteen-style restaurant attached where you can sample Iwami wagyu beef among other Japanese fare. Ohnan’s pride and joy. Locally-sourced vegetables and wagyu beef prepared Italian-style and served in rustic-chic surroundings, Ajikura is the embodiment of Ohnan’s farm-to-plate rural revitalization project. Make a reservation to avoid disappointment. 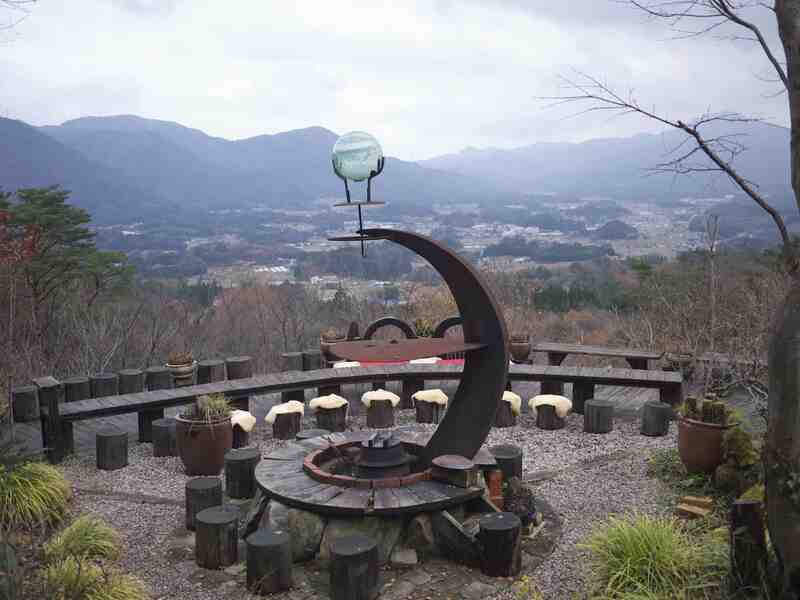 An eccentric Japanese Aladdin’s cave of antiques and hand sculptured objects with a stunning view over the O-hochi Basin. 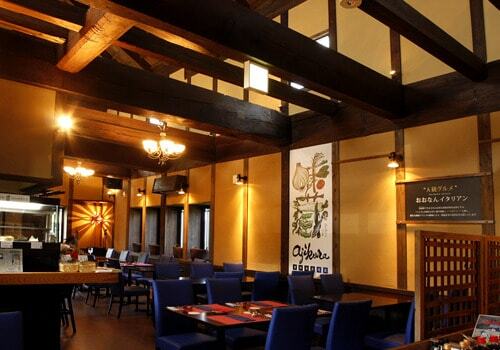 Enjoy a hearty and healthy Japanese homestyle buffet featuring many local vegetables. Coffee or Japanese tea and sweet sets also available on the terrace or inside. Fresh ice-cream made with 80% cow’s milk produced and pasteurized nearby, located just across the road from Koboku-no-mori Herb Garden. As well as gelato, they offer soft-serve ice-cream and cakes made using their non-homogenized and additive-free fresh milk. 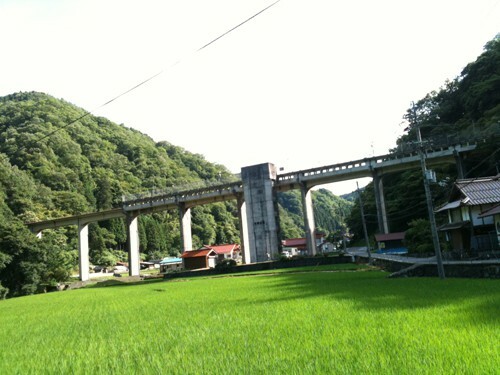 Uzui Station is on the picturesque Sankou-sen train line that runs between Miyoshi and Gotsu. The line runs high over a mountain valley, in the middle of which stands the station. You have to climb 116 stairs to reach the platform 30m above the valley floor. It’s quite a sight! An impressive 4km long ravine with many interesting rock features caused by river erosion and a distinctive flat, open valley bed. Try to count the 24 different geological features identified by a 19th century scholar as you make your way along. For those with their own transport and a sense of adventure, however, there is much more to explore. And what better way to “get Ohnan” than to time your visit with a local festival? 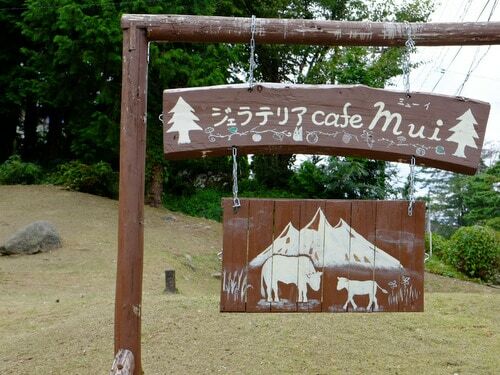 Now sleepy Izuwa was once host to one of the largest horse and cattle fairs in the region. 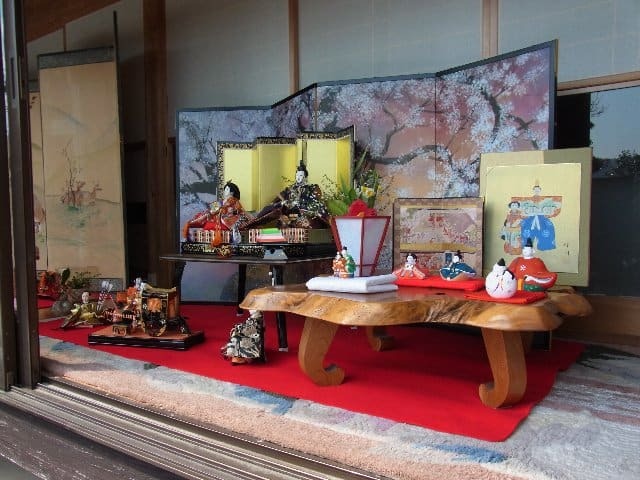 In an effort to recapture a degree of that excitement the community now invites people to wander their narrow streets and view over a thousand traditional hina dolls, displayed in local shops, private houses and gardens. The dolls are, of course, beautiful, but it’s also an excellent opportunity to get a peek behind those garden walls, without anyone calling the police. 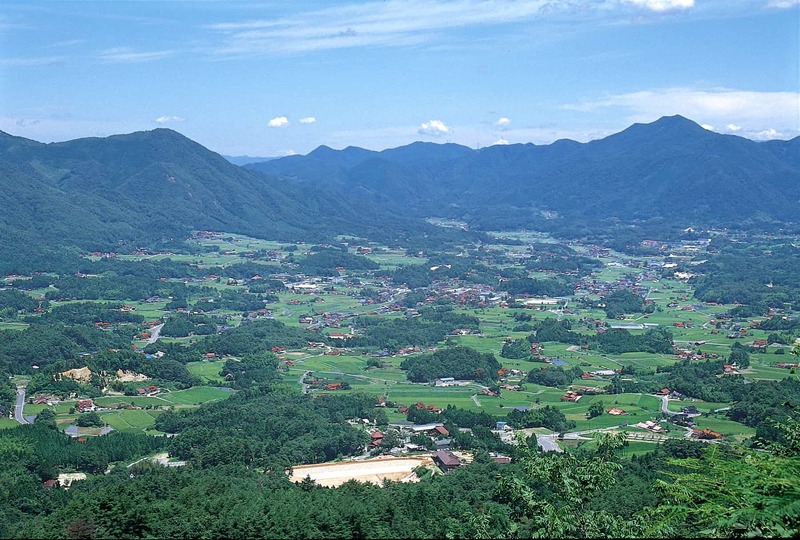 Kaizumi [川角] is known as the “Closest Village to Heaven”, not only due to its elevation, but for the fact that the average age in the handful of households that remain is over 80. After winding up through the gorgeous Kandani [神谷] rice terraces, you pop out of a tiny tunnel to find yourself on a mountaintop, hillsides ablaze with deep pink peach blossom above fields of bright yellow rapeseed flowers. This is one special place and well worth the effort. 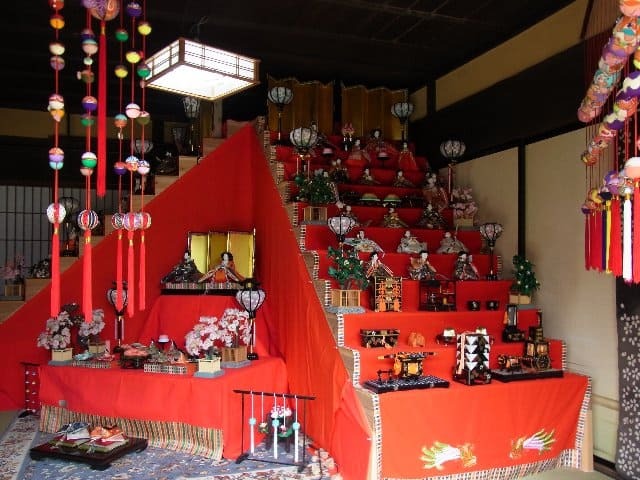 This two-day 650 year old festival is centered on Kamo Shrine in Asuna [阿須] and is said to be descended from Kyoto’s ancient Aoi Matsuri. 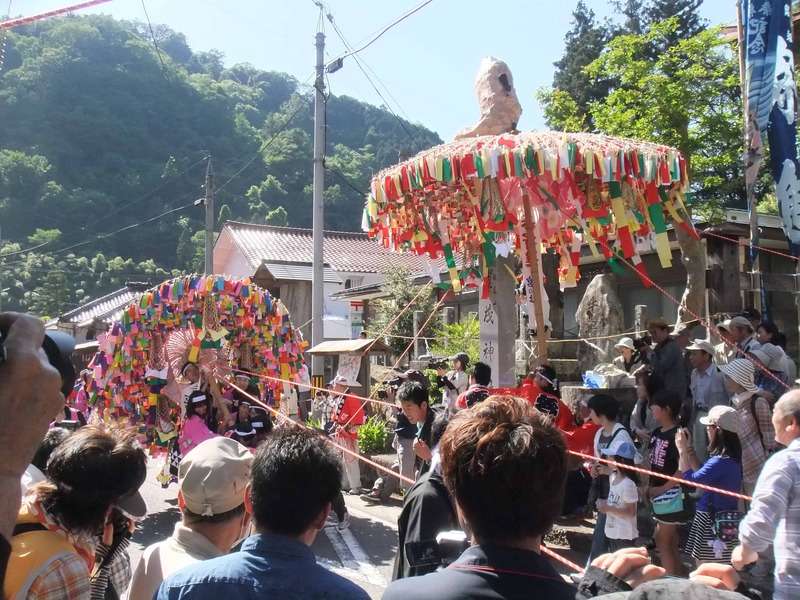 It coincides with the rice planting season, and the rites to ensure health and a bountiful harvest begin on the first day with the parading of brightly colored 5-meter high umbrellas some 4 meters in width. Dynamic Iwami Kagura dance performances follow at the shrine (the best place to watch kagura) after dark. 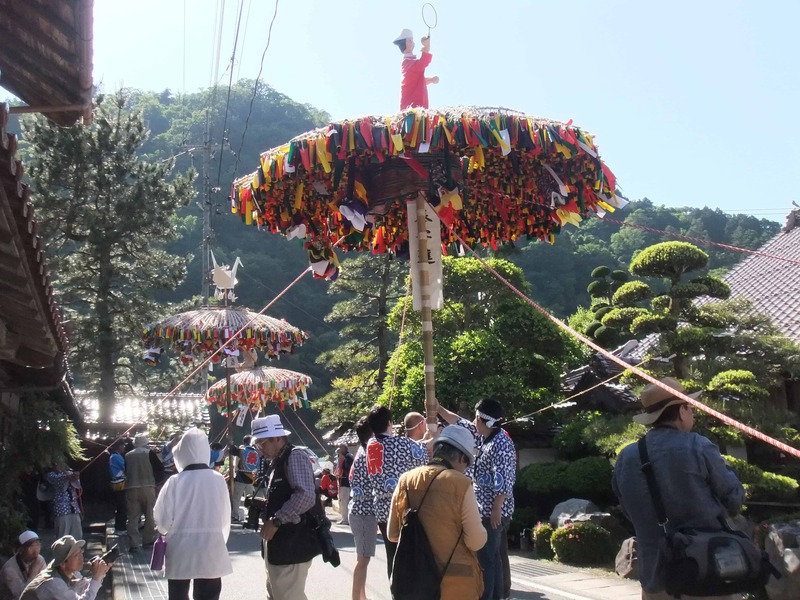 On day two, there is ritual rice planting, fun and games and children’s kagura shows. View on Google MapsThe easiest way to get to Ohnan is by car. 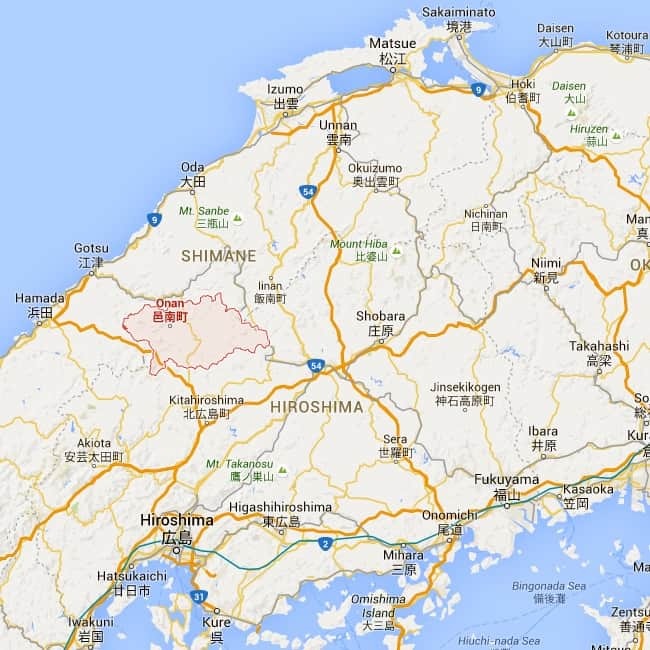 It’s about 75km to Ohnan from Hiroshima and takes just over an hour. From Hiroshima, take the Hiroshima Expressway towards Miyajima and Iwakuni. Switch to the Chugoku Expressway at Hiroshima Kita Junction and then take the Hamada Expressway from Chiyoda Junction to the Mizuho interchange, from where you take the local road to Ohnan. Highway buses for Hamada that leave from Hiroshima Station (North Shinkansen Exit) and Hiroshima Bus Center call at the Mizuho Interchange (approximately ¥2000 one way) from where you can take a local bus to Ohnan. Ohnan is in the early stages of promoting itself to non-Japanese visitors. They have just released English and Chinese language versions of its Japanese tourist information website which also includes information about other nearby Shimane locations worthy of visiting. 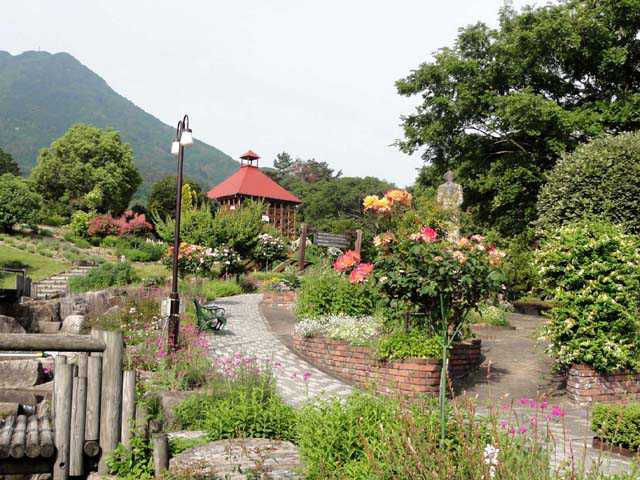 The local tourist office plans to increase the amount of foreign language content and develop a range of foreign language information pamphlets and maps which will be available from Koboku-no-mori Herb Garden in the near future. If you would like to stay in the local area and have difficulty reaching or communicating with local hotels and guesthouses, send them a message through their contact page. Wow, thanks for this! I’ve had Uzui Station on my to-see list for a while now, I didn’t really know what there was to do around there though. I might just try to pass by this summer! The Sanko rail line is pretty cool. Unfortunately moves are underway to close it so I wouldn’t leave it too long before you visit! We were back at Uzui Station last weekend and will post some more photos soon. Thanks for taking the time to comment.